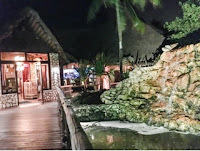 Little did I know that I’d be transported to Polynesia in the Cayman Islands. 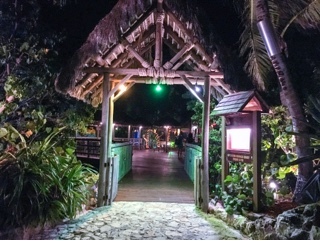 Yet, after a short drive north of Seven Mile Beach, a beautiful structure greeted us: walking along the bamboo lined bridge, taking in the large thatched roof and hearing the rustling wind blow through the palm trees … where did we go? 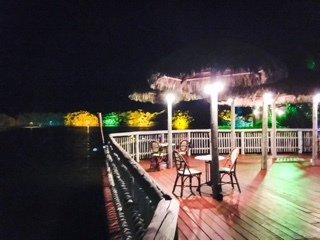 Pappagallo is a serene restaurant situated on a spacious bird sanctuary. While sitting in the screened in patio the lagoon in the background is eerily calm, but during the day there’s plenty of wildlife to behold. From the high ceiling dining room and outdoor water features, there’s so much to see with their décor that the hunger pangs momentarily subsided - to just be outdoors and take it all in! Humphrey Bogart, the restaurant’s “oldest employee”, greets us at the door and gets tons of attention. 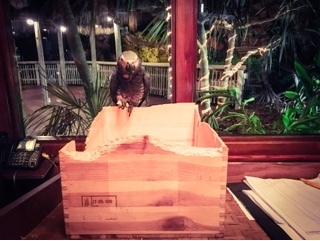 The mild tempered African Grey parrot even patiently posed on my friend’s shoulder for pictures. Then again, the smell of shellfish and garlic is so enticing; soon we were coxed into our chairs and a bottle of cold wine settling us in for dinner. 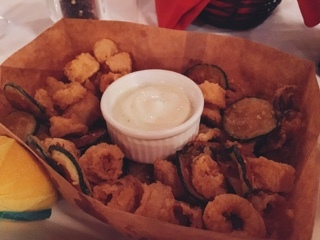 A basket of the calamari (CI$10.50) was great for sharing: plenty of squid with thinly sliced zucchini for added interest. The fried starter needed more draining as everything was rather oily and the salt was a tad heavy handed but nevertheless tasty, we finished it anyways. 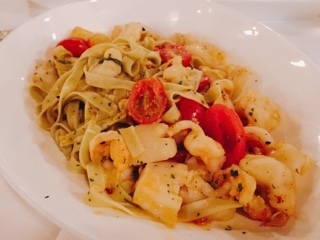 True to its Italian roots, Papagallo’s pasta dishes are large … there’s no risk of leaving hungry. The tagliatelle (CI$27.50) appeared freshly made and tossed with a fragrant garlic shrimp broth, basil and olive oil finishing it off. Although the scallops and shrimps could be cooked a touch less, they were nonetheless meaty and delicious. 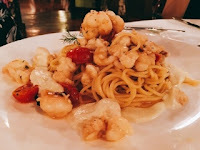 The seafood theme continued for our table with my friend ordering the lobster spaghetti (CI$32) brimming with pieces of the crustacean. 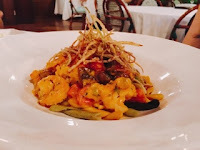 Meanwhile, the sweetness in the lobster and shrimp (CI$36) threw me off and having a whole plate of the rich brandy-tarragon cream sauce would be too much. Complimentary bites of bruschetta (fresh and tasty) and chocolate cookies (dry and powdery) were also presented. I welcomed every last bite. Anything to make the tranquil dinner, in a tropical oasis, last a few minutes longer.